On this Easter Sunday, I'm happy to introduce Susan Harris, author of Shattered Memories. ​Yes! I love YA dystopian, paranormal, fantasy novels. It takes a very special book or author to drag me from that genre! ​That’s easy! Either a criminal profiler or a personal assistant for Dave Grohl or Jared Leto! ​When I’m getting ready to start writing, the first thing I have to do is compile a playlist with all the songs I think suit the book I’m writing. All my playlists are available on my website! www.susanharrisauthor.com. Another must have for me is pens in every colour and a refill pad to make notes. I also write up character profiles in case I forget a character’s eye colour or something like that. Today's feature is on Bait, An Order of the Spirit Realm series, by author Kasi Blake. We have a new print release today in the DRAGONS OF ETERNITY Series by Julie Wetzel. FOR THE HEART OF DRAGONS is now available in print! Grab your copy today and continue this exciting Fantasy Romance series! CJ Hart, author of The Abandoned Series, talks to us today about her novel, The Hunted, book one. ​I was in my second year of college, studying Chemistry. I am thrilled to announce Julie Wetzel's novel, Burning Nights, is now available in print! Order your copy today! The fifth book in the Kindling Flames series is now available in print! If you've been collecting the gorgeous print editions of this paranormal romance series by best-selling author Julie Wetzel, now is the time to order your copy of Kindling Flames: Burning Nights! It just released in print this week. 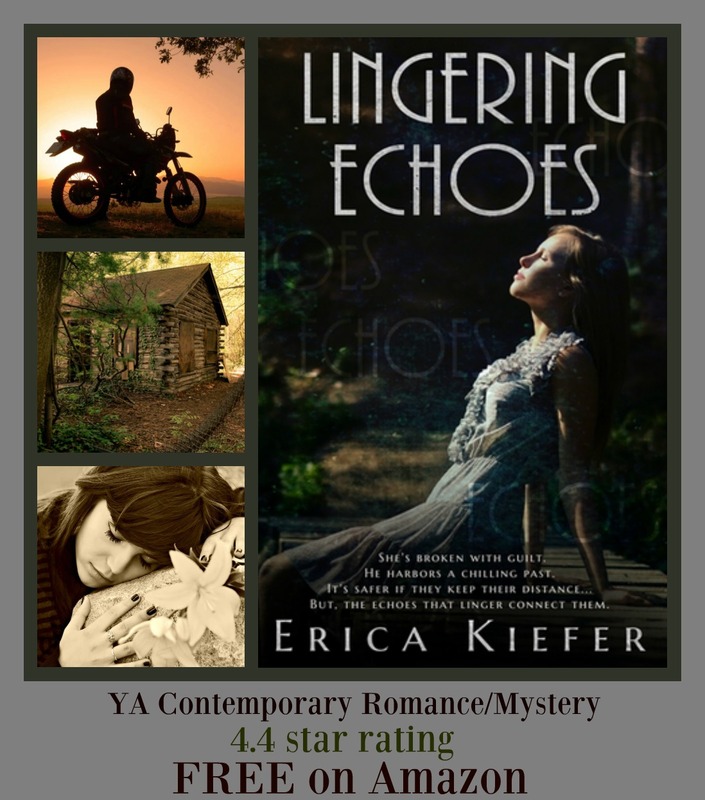 Today, I'm excited to feature Erica Kiefer, author of Lingering Echoes, which is free on Amazon! ​If only Allie Collins could go back to that tragic day one year ago, perhaps she could escape the guilt that haunts her. In reality, there was no altering her cousin’s death or the role she played. ​When Kelly is not immersed in the middle of someone else's fantasy world, she's busy creating one of her own. Never Forgotten is her first complete series, which includes Never Forgotten, Current Impressions, Always Remembered, and Sea of Memories, a novella collection. ﻿Kelly is one of the authors of award-winning Fractured Glass and 7: The Seven Deadly Sins. She also has a short story in the Twists in Time anthology, and will be part of several other anthologies releasing in 2016. You can visit her at www.KellyRisser.com, or click here to sign up for her newsletter.